Tri-Village’s Meghan Downing goes in for a score in a game earlier this season. The Lady Patriots have moved up one spot to fourth in the latest Division IV state basketball poll. After several weeks positioned at No. 5 in the Division IV girls state basketball poll, the Lady Patriots of Tri-Village have moved up one to No. 4 in this week’s ranking, released earlier this week. Tri-Village entered the week 16-1 after picking of a single win last week over Tri-County North. 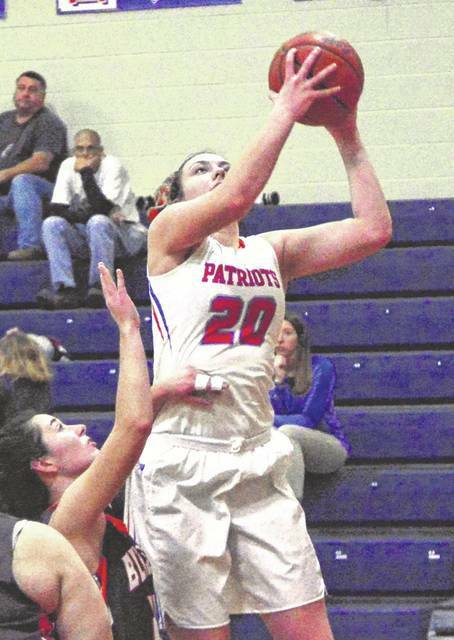 The Lady Patriots received one first-place vote and earned 130 points to jump in front of Fairfield Christian (15-0), which was ranked fourth last week but slid to the fifth spot this week. The top three teams in D-IV remained the same with Fort Loramie as the No. 1-ranked team. The Redskins (17-1) received 15 first-place votes and earned 225 points to stay in the top spot ahead of second-ranked Minster (17-1), which collected two first-place votes and 205 points. Cornerstone Christian (14-1) sits at No. 3 with two first-place votes and 151 points. Also from the Cross County Conference, Covington earned 21 points and sits just outside the top 10 at No. 11 in Division IV. The only other Darke County school ranked in the girls state poll in Versailles. The Lady Tigers remain in the sixth spot in Division III even after a pair of wins over Franklin-Monroe and Parkway last week. Versailles (13-3) received one first-place vote and totaled 96 points in this week’s poll. Defending state champion Columbus Africentric (17-0) continues its reign at the top of the Division III poll. The Nubians received 21 first-place votes and totaled 235 points to stay ahead of Findlay Liberty-Benton (16-0), Berlin Hiland (14-1) and Waynesville (15-0), all of which received one first-place vote and earned 197, 156 and 142 points respectively. Ottawa-Glandorf (18-1) is ranked fifth and earned 125 points. From the Shelby County Athletic League, Anna sits just outside the top 10 in D-III at No. 11 with 22 points. There is a new No. 1 team in Division II with New Philadelphia leap frogging Carroll for the top spot. New Philadelphia picked up a pair of wins last week over Coshocton and Byesville Meadowbrook to remain undefeated at 15-0, while Carroll suffered its first loss of the season to Beavercreek. Trotwood-Madison (No. 11), Tippecanoe (No. 14) and Franklin (No. 15) all received more than 12 points to be ranked just outside the top 10. In Division I, the No. 1 team stayed put but there is a new No. 2. While Pickerington Central (17-1) continued to stay at the top of the D-I poll, Centerville gained ground moving up from No. 3 last week. The Elks received three first-place votes and totaled 182 points to jump ahead of Canton McKinley (17-1), which totaled 174 points including two first-place votes. Pickerington Central received 16 first-place votes and 227 points. Others receiving 12 or more points: 11, Akr. Hoban 26. 12, Youngs. Austintown-Fitch 21. 13, Dublin Coffman 14. 14, Mason 12. Others receiving 12 or more points: 11, Trotwood-Madison 31. 12, Youngs. Mooney 23. 13, Chillicothe Unioto 18. 14, Tipp City Tippecanoe 13. 15, Franklin 12. 15, St. Bernard Roger Bacon 12. Others receiving 12 or more points: 11, Anna 22. 12, Lynchburg-Clay 21. 13, Delta 18. 13, Cin. Purcell Marian 18. 15, Bellaire 16. 15, Cardington-Lincoln 16. 15, Warren Champion 16. 18, Orrville 12. Others receiving 12 or more points: 11, Covington 21. 12, Newark Cath. 15. 13, Shadyside 13.